Here’s To Those Who Eat Dog Meat. ‘It’s that time of year again when the Lychee and Dog Meat Festival in Yulin, China sets off a global debate on animal welfare and the limits of multicultural tolerance. In previous years some 10,000 dogs have been slaughtered and eaten over the 10-day festival. However, often the critics find it unacceptable that dogs are being caged, killed and eaten at all. Such complaints are justified when they come from vegans who are equally upset about the conditions of pigs and cows in western industrial farms. But they are simply hypocritical when they come from carnivores who happily eat intensively reared pigs, or even from vegetarians whose milk and cheese comes from cattle kept in such poor conditions that large swathes of the herds are lame. However, those who say any criticism at all is a kind of moral imperialism are also guilty of lazy thinking. Almost everyone believes that respect for difference has its limits. I know of no one who in the name of cultural diversity defends the barbaric practices of ISIS, the chillingly efficient holocaust perpetrated by the Third Reich, or the execution of homosexuals and atheists in some Islamic countries. What presents itself as open-minded tolerance can very easily become a kind of condescension, as though the Chinese cannot be expected to live up to our highest ideals. In fact, protest against the Yulin festival began in China, where retired school teacher Yang Xiaoyun paid thousands of dollars to save dogs and cats from the festival, and celebrities such as Chen Kun, Yang Mi and Fan Bingbing have spoken out against it. 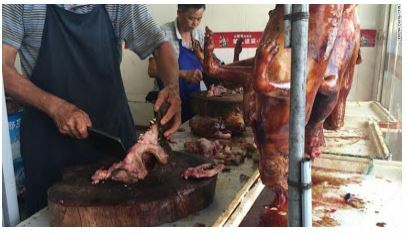 Although dog eating is a tradition in parts of China, the Yulin festival was only started in 2009 and is not endorsed by the local government. What I also find troubling about issues like this is how they insidiously bring out the xenophobe in otherwise liberal people on both sides of the argument. When I previously wrote about the festival, one person who ranted against me tweeted that all Koreans were evil because they ate dogs. Such blatantly racist sentiments are rarely expressed so openly but I fear many who condemn the Yulin festival are also confirming their own prejudices about “backward” Asian peoples who are inherently cruel and incapable of being sympathetic towards animals. ‘Seeing one video of one dog being beaten is not enough to condemn the whole festival, just as knowing that there have been abuses in some Western abattoirs does not condemn the whole meat industry. ‘Then, they should think hard about the right way to express their disapproval. Some claim that social media pressure from the West has led to a decline in the number of dogs killed to around 1,000, but it is hard to know what is really responsible for the drop. ‘Usually any perception of outside “Western” pressure is counterproductive for a campaign. What do you think, is it good to eat dog meat? APC May Settle on General Buhari as its Presidential Candidate. Previous articleIceland deports Nigerian man who claimed he was a victim of Boko Haram.